Members of the Church of Jesus Christ Christian-Aryan Nation held a protest in downtown St. Louis on Saturday. About twenty members turned out for their protest. 50 or 60 Ferguson counter demonstrators protested against the racist group. They were carrying cop-hating signs. 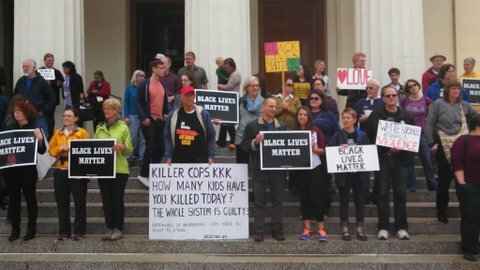 About a score of white supremacists and about 50 or 60 activists against racism spent a while trying to out-shout each other early Saturday afternoon on the west steps of the Old Courthouse downtown. There was no physical contact but plenty of yelling through a steady rain from camps separated by barricades put in place by National Park Service rangers. Some rangers and city police officers watched from the periphery. Members of the Church of Jesus Christ Christian-Aryan Nation obtained a permit to demonstrate at the landmark from 1:30 to 3:30 p.m. They were calling for release of Gary Yarbrough, sentenced in 1986 to 60 years in federal prison in an anti-government racketeering and weapons case. When they arrived, a group called the Anti-Racist Collective was waiting, having gathered across Broadway at Kiener Plaza at 11:30 a.m. While many of the Aryans held signs for Yarbrough, they also held a banner comparing diversity to “white genocide.” Much of what they shouted at protesters had little to do with Yarbrough. 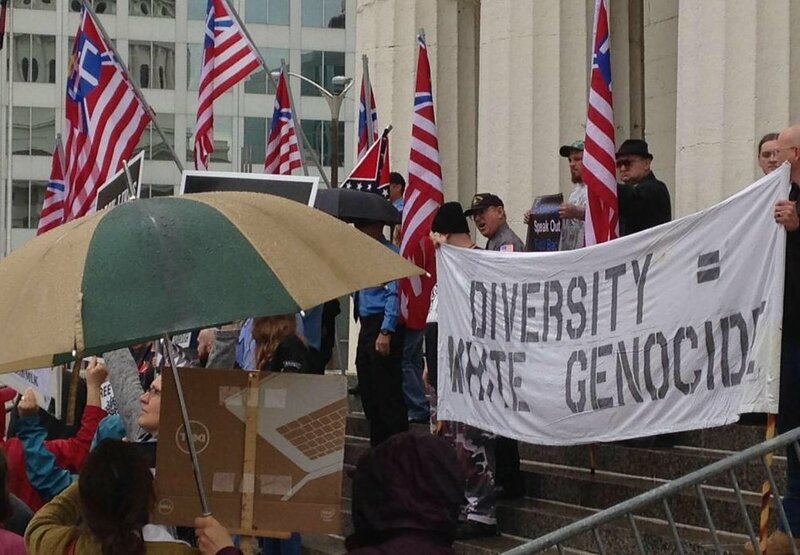 Aryan Brotherhood actively spreading hate on the steps of the St. Louis Courthouse.